Quilters get almost giddy over Tula Pink's cool, innovative style and use of color. As they move through her latest book, they'll be ready to toss out that primitive color wheel and commit to the Tula Pink approach. In this book, this innovative designer will give you a comprehensive color education by simply pairing one quilt shape with one color family in each chapter. You can step through 17 quilts of varying sizes, including the final rainbow chapter, because ""everyone loves rainbows."" 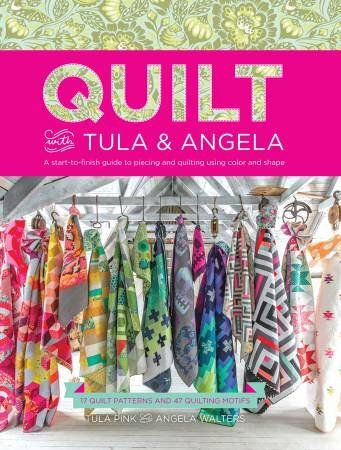 You will also get to eavesdrop on the creative collaboration between Tula and Angela Walters: no vague advice to ""quilt as desired"" in this book. Angela chooses from 24 quilting motifs she provides to lend the ultimate surface interest to every project. Tips and techniques on binding, backing, piecing and tools are invaluable, and as always the book will be heavy on colored illustrations.